WhisperTouch volume controls provide for clear, distortion-free stereo music reproduction when one or multiple speaker pairs are powered by a single amplifier. 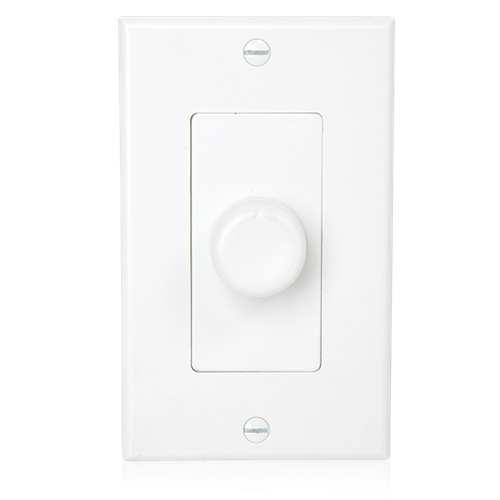 Model DWT-8 is an 8 ohm device with a decora-style wall plate. Frequency response is 20Hz - 20kHz. Attenuation is accomplished in ten steps plus positive off. The first six steps are 3dB for fine tune control at low listening levels, the next three steps are 6dB, followed by one 9dB step and finally one 28dB step before "off". The low-profile knob is pleasant to the touch and adjusts easily. It measures 15/16" Dia. and projects a mere 1/2" for unobtrusive yet functional operation. The control operates smoothly with fine detents and make-before-break contacts for gradual and un-interrupted transition when changing volume settings. High quality units require 12 to 18-gauge wire and terminate with convenient plug-in connectors. Assemblies measure 2-3/4" deep and mount into a standard 20 cu.in. E.O. Box (by others). Specify plate color: suffix (-I) for ivory or (-W) for white.